"Bethak" redirects here. For sacred sites of Pushtimarg Hinduism, see Baithak. For other uses, see Baithak (disambiguation). In strength training and fitness, the squat is a compound, full-body exercise that trains primarily the muscles of the thighs, hips and buttocks, quadriceps femoris muscle (vastus lateralis, vastus medialis, vastus intermedius and rectus femoris), hamstrings, as well as strengthening the bones, ligaments and insertion of the tendons throughout the lower body. Squats are considered a vital exercise for increasing the strength and size of the legs as well as developing core strength. Squats are typically used to tone back, thigh, and hip stability. Isometrically, the lower back, the upper back, the abdominals, the trunk muscles, the costal muscles, and the shoulders and arms are all essential to the exercise and thus are trained when squatting with the proper form. The squat is one of the three lifts in the strength sport of powerlifting, together with deadlifts and bench press. It is also considered a staple in many popular recreational exercise programs. Volume is expressed as sets performed × number of repetitions × external weight. Adding resistance to squats has been shown to affect the power and speed of the exercise. Though free-weight numbers fit nicely into the volume equation, adding resistance can complicate the equation and make volume less easy to calculate. More specifically, people have found that they can increase resistance while exercising by utilizing chains or rubber bands. One study discovered that the physical demand of exercises with resistance increases in a linear relationship with intensity. Differences in energy expenditure during squatting can be attributed to the various forms of movements, intensities, weights, repetitions, and types of items (Smith machine or barbell). Individuals who are interested in strength training can utilize barbell squat in training and rehabilitation programs. If executed with proper form, the squat has the potential to develop knee stability. On the other hand, if done incorrectly, injuries to the knees and back can occur. The parallel squat is one way to increase knee flexion while activating the quadriceps and hamstrings. In the standard squat, it is crucial to have the shin vertical to minimize stress on the knee. Variations in squats include various knee placements and squat depths. For example, knees can be placed in knees-in, knees-out, and knees-over-toes; whereas squats can be performed at roughly 20°, 50°, and 80°. The parallel squat is more preferred than the deep squat because the potential of injury on the cruciate and menisci ligaments is higher in the latter. The movement begins from a standing position. Weight is often added; typically in the form of a loaded barbell but dumbbells and kettlebells may also be used. When a barbell is used, it may be braced across the upper trapezius muscle (a high bar squat) or held lower across the upper back and rear deltoids (a low bar squat). The movement is initiated by moving the hips back and bending the knees and hips to lower the torso and accompanying weight, then returning to the upright position. Squats can be performed to varying depths. The competition standard is for the crease of the hip (top surface of the leg at the hip joint) to fall below the top of the knee; this is colloquially known as "parallel" depth. Confusingly, many other definitions for "parallel" depth abound, none of which represents the standard in organized powerlifting. From shallowest to deepest, these other standards are: bottom of hamstring parallel to the ground; the hip joint itself below the top of the knee, or femur parallel to the floor; and the top of the upper thigh (i.e., top of the quadriceps) below the top of the knee. Squatting below parallel qualifies a squat as deep while squatting above it qualifies as shallow. Some authorities caution against deep squats; though the forces on the ACL and PCL decrease at high flexion, compressive forces on the menisci and articular cartilages in the knee peak at these same high angles. This makes the relative safety of deep versus shallow squats difficult to determine. As the body gradually descends, the hips and knees undergo flexion, the ankle extends ("dorsiflexes") and muscles around the joint contract eccentrically, reaching maximal contraction at the bottom of the movement while slowing and reversing descent. The muscles around the hips provide the power out of the bottom. If the knees slide forward or cave in then tension is taken from the hamstrings, hindering power on the ascent. Returning to vertical contracts the muscles concentrically, and the hips and knees undergo extension while the ankle plantarflexes. Two common errors include descending too rapidly and flexing the torso too far forward. Rapid descent risks being unable to complete the lift or causing injury. This occurs when the descent causes the squatting muscles to relax and tightness at the bottom is lost as a result. Over-flexing the torso greatly increases the forces exerted on the lower back, risking a spinal disc herniation. Another error where health of the knee joint is concerned is when the knee is not aligned with the direction of the toes. If the knee is not tracking over the toes during the movement this results in twisting/shearing of the joint and unwanted torque affecting the ligaments which can soon result in injury. The knee should always follow the toe. Have your toes slightly pointed out in order to track the knee properly. Heels off floor: Raising the heels compromises balance and reduces the contribution of the gluteus and hamstring muscles. Knees not in line with toes: If the knees are not in line with the toes it means they have entered a valgus position, which adversely stresses the knee joint. Poor foot placement: Placing the feet in an compensatory or asymmetric position can lead to structural problems in the movement. Allowing the back to round. Various types of equipment can be used to perform squats. A power cage can be used to reduce risk of injury and eliminate the need for a spotting partner. By putting the bar on a track, the Smith machine reduces the role of hip movement in the squat and in this sense resembles a leg press. The monolift rack allows an athlete to perform a squat without having to take a couple of steps back with weight on as opposed to conventional racks. Not many powerlifting federations allow monolift in competitions (WPO, GPC, IPO). Other equipment used can include a weight lifting belt to support the torso and boards to wedge beneath the ankles to improve stability and allow a deeper squat (weightlifting shoes also have wooden wedges built into the sole to achieve the same effect). Wrist straps are another piece of recommended equipment; they support the wrist and help to keep it in a straightened position. They should be wrapped around the wrist, above and below the joint, thus limiting movement of the joint. Heel wedges and related equipment are discouraged by some as they are thought to worsen form over the long term. The barbell can also be cushioned with a special padded sleeve. On 8 October 2011, Jonas Rantanen of Finland performed a squat with a weight of 575 kg (1268 lb) at the Bullfarm Powerlifting Championships in Helsinki, beating the previous record by Donnie Thompson (USA) of 573 kg (1265 lb). The single-ply squat record is held by Dustin Slepicka (USA) at 500 kg (1102 lb). The raw world record with knee wraps is 525 kg (1157 lb) performed by Vlad Alhazov on 23 December 2018. The raw world record without knee wraps belongs to Ray Williams who lifted 490 kg (1080 lb) in March 2019, at the Arnold Classic in Columbus, Ohio. The women world record belongs to Olga Gemaletdinova who lifted 310.0 kg (684 lb) on 5 May 2011. The most squats with 130 kg in two minutes was Netherlands woman Maria Strik. She squatted a weight of 130 kg, 29 times within two minutes. The most bodyweight squats performed in one hour is 4,708 by Paddy Doyle (UK) on November 2007. The most bodyweight sumo squats in one hour is 5,135, and was achieved by Dr. Thienna Ho (Vietnam) on December 2007.
the most single leg squats (pistols) in one minute: 47 on January 2012.
the most squats in one minute carrying a 60 lb pack: 47 on June 2016 (the previous was 44 by Paddy Doyle). the most squats in one minute carrying an 80 lb pack: 42 on July 2016.
and the most pistol squats on an american football ball in one minute: 23 on July 2015. Starting position of a front squat, using the "California" or cross-armed grip. Back squat – the bar is held on the back of the body upon the upper trapezius muscle, near to the base of the neck. Alternatively, it may be held lower across the upper back and rear deltoids. In powerlifting the barbell is often held in a lower position in order to create a lever advantage, while in weightlifting it is often held in a higher position which produces a posture closer to that of the clean and jerk. These variations are called low bar (or powerlifting squat) and high bar (or olympic squat), respectively. Sumo squat – the barbell is rested on the shoulders in the usual squat position. The legs should be slightly wider than shoulder width apart and the feet should be pointed outwards. when squatting, you should feel a stretch on the adductor longues and adductor magnus muscles which are found on the inner thigh. Box squat – at the bottom of the motion the squatter will sit down on a bench or other type of support then rise again. The box squat is commonly utilized by power lifters to train the squat. Pausing on the box creates additional stimulus in the hips and glutes. Some people believe this form of isometric training allows for greater gains in the squat compared to a traditional Olympic style squat, while others contend that the increased spinal loading creates more opportunity for injury. Front squat – the weight (usually a barbell) is held in front of the body across the clavicles and deltoids in either a clean grip, as is used in weightlifting, or with the arms crossed and hands placed on top of the barbell. Hack squat – the barbell is held in the hands just behind the legs; this exercise was first known as Hacke (heel) in Germany. According to European strength sports expert and Germanist Emmanuel Legeard this name was derived from the original form of the exercise where the heels were joined. The hack squat was thus a squat performed the way Prussian soldiers used to click their heels ("Hacken zusammen"). The hack squat was popularized in the English-speaking countries by early 1900s wrestler George Hackenschmidt. It is also called a "rear deadlift". 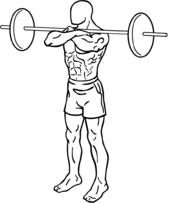 Zercher squat – the barbell is held in the crooks of the arms, on the inside of the elbow. One method of performing this is to deadlift the barbell, hold it against the thighs, squat into the lower portion of the squat, and then hold the bar on the thighs as you position the crook of your arm under the bar and then stand up. This sequence is reversed once the desired number of repetitions has been performed. Named after Ed Zercher, a 1930s strongman. Deep knee bend on toes - similar to a normal back squat only the lifter is positioned on their forefeet and toes, with their heels raised, throughout the repetition. Usually, the weight used is not more than moderate in comparison to a flat footed, heavy back squat. Loaded squat jump - the barbell is positioned similarly to a back squat. The exerciser squats down, before moving upwards into a jump, and then landing in approximately the same position. The loaded squat jump is a form of loaded plyometric exercise used to increase explosive power. Variations of this exercise may involve the use of a trap bar or dumbbells. Split squat – an assisted one-legged squat where the non-lifting leg is rested on the ground a few 'steps' behind the lifter, as if it were a static lunge. Bulgarian squat – performed much like a split squat, but the foot of the non-lifting leg is rested on a knee-high platform behind the lifter. Goblet squat – a squat performed while holding a kettlebell next to one's chest and abdomen with both hands. Sissy squat – a squat with several sorts (dumbbell, weight plate, Smith machine, barbell, bodyweight). In the most common variant, a dumbbell is held behind the legs while the heels are lifted off the ground and the torso remains flat while the lifter leans backwards; sometimes done with a plate held on the chest and one arm holding onto a chair or beam for support. Unlike most other squat variations, Vince Gironda promoted sissy squat as a rectus femoris isolation exercise. Smith squat – a squat using a Smith machine. Hack squats can be done easily this way, as in the picture. A Smith squat is often considered inferior to the free-weight variant because of the lack of recruitment of auxiliary muscles and limited range of movement. Trap bar squat – a trap bar is held with hands at the sides. This movement is more correctly called a lift. Bodyweight squat – done with no weight or barbell, often at higher repetitions than other variants. Overhead squat – a non-weight bearing variation of the squat exercise, with the hands facing each other overhead, biceps aligned with the ears, and feet hip-width apart. This exercise is a predictor of total-body flexibility, mobility, and possible lower body dysfunction. Face the wall squat – performed with or without weights. It is primarily to strengthen the vertebrae tissues. [vague] In the Chinese variant (面壁蹲墙) weights are not used. Toes, knees and nose line up almost touching the wall. Advanced forms include shoeless, wrists crossed behind the back, and fists in front of forehead, all performed with toes and knees closed and touching the wall. 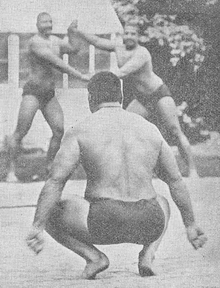 A photo of an Indian wrestler performing baithaks (Hindu squats). Hindu squat – also called a baithak, or a deep knee bend on toes. It is performed without weight, with the heels raised, and body weight placed on the forefeet and toes; during the movement, the knees track far past the toes. The baithak was a staple exercise of ancient Indian wrestlers. It develops strength, endurance and flexibility throughout the legs, calves, lower back and thighs. To perform a baithak, the exerciser stands on their forefeet with their hands by their sides. They bend their legs and squat down. They then stand up again. There is only a relatively small movement of the arms. Hindu Jumper Squat – Done without weight. Similar to Hindu squat, but a bounce / light forward or backward jump of about six inches is added before and after each rep. Then land in a squat with heels elevated. Then jump back to the starting position. Repeat as many times as you can. Pistol – a bodyweight single leg squat done to full depth, while the other leg is extended off the floor. Sometimes dumbbells, kettlebells or medicine balls are added for resistance. Shrimp squat – also called the flamingo squat, a version of the pistols squat where instead of extending the non-working leg out in front, it is bent and placed behind the working leg while squatting, perhaps held behind in a hand. Monkey F***** – In American military training, this type of squat is used to warm up before a session of physical exercise. It is performed by the person standing with feet at distance of shoulder length. In a bent position and the arms goes between the legs, and around to the outside of the ankles and grab the back of the ankle. During this exercise the hips are lowered repeatedly, and the appearance of this exercise lead to its name. Although the squat has long been a basic element of weight training, it has in recent years been the subject of considerable controversy. Some trainers allege that squats are associated with injuries to the lumbar spine and knees. Others, however, continue to advocate the squat as one of the best exercises for building muscle and strength. Some coaches maintain that incomplete squats (those terminating above parallel) are both less effective and more likely to cause injury than a full squat (terminating with hips at or below knee level). A 2013 review concluded that deep squats performed with proper technique do not lead to increased rates of degenerative knee injuries and are an effective exercise. The same review also concluded that shallower squats may lead to degeneration in the lumbar spine and knees in the long-term. Man completing a heavy squat exercise. Squats can be used for some rehabilitative activities because they hone stability without excessive compression on the tibiofemoral joint and anterior cruciate ligament. It is important to note that deeper squats are associated with higher compressive loads on patellofemoral joint. As a result, it is possible that people who suffer from pain in the patellofemoral joint cannot squat at increased depths. For some knee rehabilitation activities, patients might feel more comfortable with knee flexion between 0 and 50° because it places less force compared to deeper depths. Another study shows that decline squats at angles higher than 16° may not be beneficial for the knee and fails to decrease calf tension. Other studies have indicated that the best squat to hone quadriceps without inflaming the patellofemoral joint occurs between 0° and 50°. Combining single-limb squats and decline angles have been used to rehabilitate knee extensors. Conducting squats at a declined angle allows the knee to flex despite possible pain or lack of mobilization in the ankle. If therapists are looking to focus on the knee during squats, one study shows that doing single-limb squats at a 16° decline angle has the greatest activation of the knee extensors without placing excessive pressure on the ankles. This same study also found that a 24° decline angle can be used to strengthen ankles and knee extensors. ^ a b Escamilla RF, Fleisig GS, Lowry TM, Barrentine SW, Andrews JR (June 2001). "A three-dimensional biomechanical analysis of the squat during varying stance widths". Medicine and Science in Sports and Exercise. 33 (6): 984–98. PMID 11404665. ^ a b Rippetoe M (2007). Starting Strength: Basic Barbell Training, p.8. The Aasgaard Company. p. 320. ISBN 0-9768054-2-1. ^ a b c Shoepe T (2017). "Volume Estimations for Combined Free-Weight and Rubber-Band Resistance Exercise". Kinesiology. 49.2: 169–177. ^ Loturco I, Pereira LA, Moraes JE, Kitamura K, Cal Abad CC, Kobal R, Nakamura FY (2017-01-23). "Jump-Squat and Half-Squat Exercises: Selective Influences on Speed-Power Performance of Elite Rugby Sevens Players". PLOS One. 12 (1): e0170627. doi:10.1371/journal.pone.0170627. PMC 5256944. PMID 28114431. ^ a b Reis VM, Garrido ND, Vianna J, Sousa AC, Alves JV, Marques MC (2017-07-24). "Energy cost of isolated resistance exercises across low- to high-intensities". PLOS One. 12 (7): e0181311. doi:10.1371/journal.pone.0181311. PMC 5524349. PMID 28742112. ^ a b c Escamilla RF (January 2001). "Knee biomechanics of the dynamic squat exercise". Medicine and Science in Sports and Exercise. 33 (1): 127–41. PMID 11194098. ^ a b Fry AC, Smith JC, Schilling BK (November 2003). "Effect of knee position on hip and knee torques during the barbell squat" (PDF). Journal of Strength and Conditioning Research. 17 (4): 629–33. PMID 14636100. ^ a b "Bodyweight Squat". acefitness.org. American Council on Exercise. Retrieved 27 March 2011. ^ a b c d Brown SP (2000). Introduction to exercise science. Lippincott Wims & Wilkins. pp. 280–1. ISBN 0-683-30280-9. ^ Hanna, Wade (March 2002) Squat depth clarified. USA Powerlifting Online Newsletter. Usapowerlifting.com. Retrieved on 2013-08-05. ^ Hi- and Low-bar Squatting. Home.comcast.net. Retrieved on 2013-08-05. ^ 6 Things I Really Dislike. T Nation. Retrieved on 2013-08-05. ^ A Closer Look at the Parallel Squat. Bigger Faster Stronger, March/April 2008, pp. 36–38. ^ Kellis E, Arambatzi F, Papadopoulos C (October 2005). "Effects of load on ground reaction force and lower limb kinematics during concentric squats". Journal of Sports Sciences. 23 (10): 1045–55. doi:10.1080/02640410400022094. PMID 16194981. ^ Clarkson, HM, and Gilewich, GB (1999) Musculoskeletal Assessment: Joint Range Of Motion And Manual Muscle Strength. Baltimore, MD: Williams and Wilkins, p. 374, ISBN 0683303848. ^ Sandvik E. "The 11 Worst Squat Mistakes". T NATION. Retrieved 7 April 2018. ^ Cornacchia, pp. 121, 125. ^ McRobert S (1999). The Insider's Tell-All Handbook on Weight-Lifting Technique. CS Publishing. ISBN 9963-616-03-8. ^ Jonas Rantanen Breaks World Record Squat. SeriousPowerLifting. Retrieved 2013-03-15. ^ "Records - International Powerlifting Federation IPF". www.powerlifting-ipf.com. ^ Glenday C (2013). 2013 Guinness World Records Limited. p. 104. ISBN 978-1-908843-15-9. ^ "Most squats in one hour". Guinness World Records. ^ "Most sumo squats in one hour". Guinness World Records. ^ "Most squats in one minute (single leg)". Guinness World Records. ^ "Most squats in one minute carrying a 60 lb pack". Guinness World Records. ^ "Watch 'World's Fittest Man' Paddy Doyle reclaim record for longest plank while carrying a 100-lb pack". Guinness World Records. ^ "Most squats in one minute carrying an 80 lb pack". Guinness World Records. ^ "Most pistol squats on a scaffold pole in one minute". Guinness World Records. ^ "Most pistol squats on an american football ball in one minute". Guinness World Records. ^ Hackenschmidt, George (1908). The Way To Live in Health and Physical Fitness. York. p. 70. ^ Emmanuel L (2008). Les Fondamentaux. Paris. p. 142. ^ Periodic Table of Bodyweight Exercises with Clickable Videos. Strength.stack52.com. Retrieved on 2015-04-24. ^ Platt, Piers (25 February 2014). "Combat and Other Shenanigans: A Humorous Memoir from the Iraq War". Piers Platt – via Google Books. ^ Hartmann H, Wirth K, Klusemann M (October 2013). "Analysis of the load on the knee joint and vertebral column with changes in squatting depth and weight load". Sports Medicine. 43 (10): 993–1008. doi:10.1007/s40279-013-0073-6. PMID 23821469. ^ a b c Jaberzadeh S, Yeo D, Zoghi M (September 2016). "The Effect of Altering Knee Position and Squat Depth on VMO : VL EMG Ratio During Squat Exercises". Physiotherapy Research International. 21 (3): 164–173. doi:10.1002/pri.1631. PMID 25962352. ^ a b c d e Richards J (2008). "A Biomechanical Investigation of a Single-Limb Squat: Implications for Lower Extremity Rehabilitation Exercise". Journal of Athletic Training. 43: 477–482. Cornacchia L, Bompa TO, Di Pasquale MG, Di Pasquale M (2003). Serious strength training. Champaign, IL: Human Kinetics. ISBN 0-7360-4266-0.